An enticing interpretation of the traditional Thanksgiving pie, this delicious pumpkin dessert is drizzled with rich caramel. Heat oven to 350 degrees Fahrenheit. Beat egg yolks, pumpkin, pumpkin pie spice and vanilla in small bowl. Beat egg whites with cream of tartar in mixer bowl with whisk attachment on high speed until foamy. Beat in sugar, 2 tablespoons at a time, until whites are glossy and stand in soft peaks. Fold in egg yolk mixture, cracker crumbs, dates and pecans. Spread in two greased 8-inch round cake pans. Bake in 350 degree oven until knife inserted near center comes out clean, 25 to 30 minutes. Cool on wire rack. Loosen cakes from sides of pans with thin knife. Gently shake cakes out of pans onto racks. Beat cream cheese, powdered sugar and 2 tablespoons caramel sauce in small bowl until smooth. Place one layer on serving plate. Spread with half the cream cheese filling. Top with second layer. Spread with remaining cream cheese filling. Refrigerate until serving. 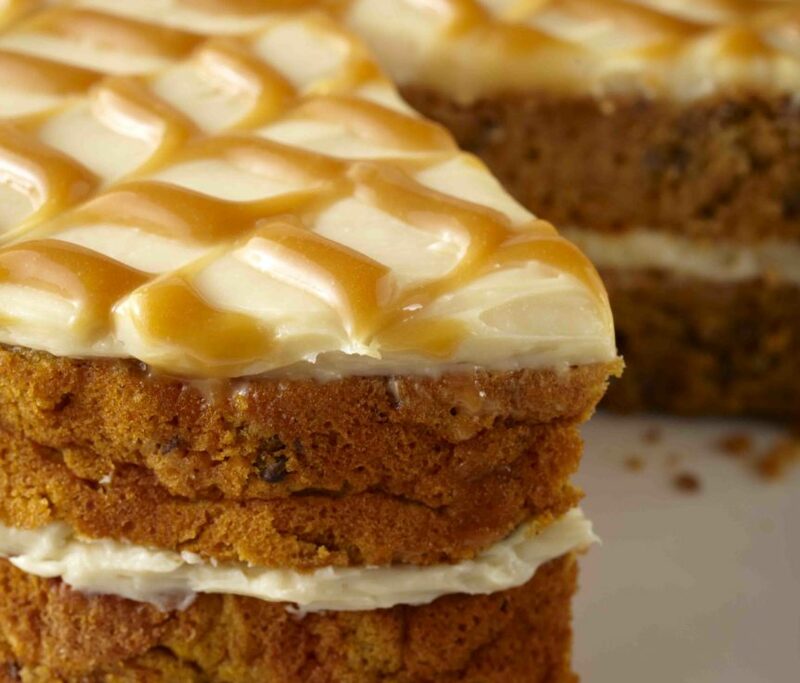 Just before serving, drizzle remaining caramel sauce over top of cake.